Company Name :Top International, Inc. The green washing ball is a detergent-saving product to protect the ecological environment and prevent damage of clothes & skin trouble by remaining detergents in clothes. - The product is designed in a round shape in order to minimize the damage of laundry. - It is very hygienic owing to the influence of its excellent antibacterial effect (eliminate bacteria and mold, etc.). - Also, it can clean clothes and laundry without any detergents by lowering the surface or interfacial tension. 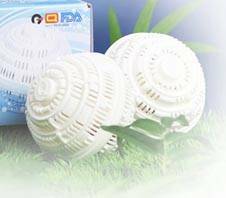 - The rubbing effect of water and laundry increases the cleaning and deodorizing power by activated water through the influence of wavelength energy of far infrared rays emitted from functional ceramic ball contained in the ball. - As compared with the normal washing process, we can obtain effects by reducing the use of synthetic detergent like: water-saving, electric energy-saving and time-saving. So it is very economical and pro-environmental. In addition, it helps prevent the damage of clothes and skin trouble to be able to occur by remaining detergents in clothes after washing. Established in 1997, Top international, Inc. is a manufacturer and exporter of health and beauty care products of good design and reasonable prices. Our products have gotten KFDA, FDA, CE, NSF and other certification.